Phaius francoisii (Schltr.) Summerh. 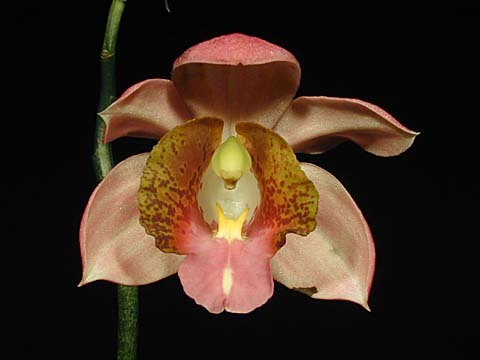 1971 Photo courtesy of Andy's Orchids Copyright © 2002 All rights reserved. A very handsome, medium to large sized, cool growing terrestrial orchid found in Madagascar at elevations of 1200 to 1600 meters in humid forests with absolutely beautiful flowers, dark-green, 12" foliage with very undulated edges, erect 2 ft. spike arising in the late spring and summer with stunning 1 1/2" flowers, sepals and petals are white inside and purple outside, the tri-lobed lip is violet rose and reddish brown on a golden background.